Today's fuels are less stable and breakdown over time, allowing contaminants to thrive in storage tanks. Without proper cleaning, tanks are susceptible to sludge buildup, loss of capacity and contamination. In addition, tanks must be cleaned prior to inspection, maintenance, decommissioning, transportation as well as any product changeover. With the AlphaJET system, you can clean an entire AST in minutes, while purifying the fuel. 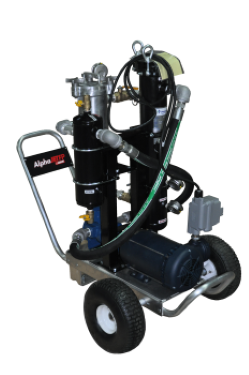 The AlphaJET System utilizes an AlphaFP which can fit through a standard 2 in. (50 mm) opening. In using Alfa Laval's rotary impingement tank cleaning, the AlphaJET will thoroughly clean tanks up to 1,250 gallons (4,750 l) in capacity, from one inlet - where snaking or cutting and entry often fail to clean the top-half of the tank. The system is designed to utilize the diesel or other class II fuels as the cleaning agent, therefore requiring no water. Equipped with a series of filters, the system will capture all bulk sludge as well as the finer particulates, therefore leaving both a clean tank and polished fuel. This system is not to be used with water or gasoline. Wash Cycle Time: 3-20 min. Class II fuel and sludge are suctioned from the tank through a hose, by the pressure boosting pump, and passed through a series of filters to remove the sludge and particulates, producing a polished fuel which then continues through the pump and the AlphaFP on to the tank walls, blasting residue from the surface in a precise global-indexing pattern, creating a closed loop cleaning circuit with a cycle time of 3-7 minutes. Note: Discharge container for sludge (recommended not included).